Pacific Electric outbound blimp no. 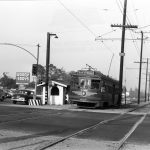 412 pauses at the San Marino Station, located at Huntington Drive and San Marino Avenue, in 1950. This was a fairly rare sight–most of the times when “Blimps” went by my home in Monrovia, they were Race Track Specials. And it looks like there’s a bus behind the station–possibly waiting for connecting passengers going to Lamanda Park and Sierra Madre. 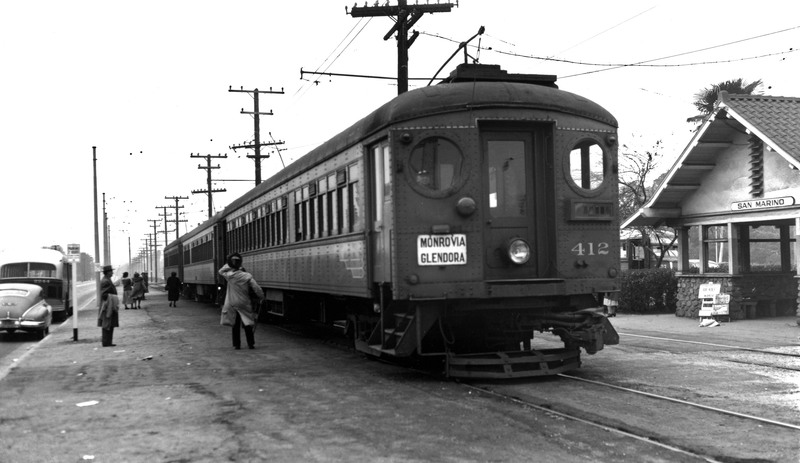 Sierra Madre rail service quit in Oct. 1950. A three car train of “Blimps” would have probably dragged down the trolley voltage to well below 600 volts. I remember the 3-car rush hour trains of 1100s and 1200s leaving 5th Ave. after stopping to let off passengers–the motors would groan and the car lights would dim, and we were only a mile or so from the Arcadia substation. A useful street address would be 2200 Huntington Dr. Whoever took the photo was standing where the left turn lane for drivers heading eastward on Huntington to head northward on Sierra Madre Blvd. is today. Back when the PE was still running, my brother and I would ride from 5th Ave. in Monrovia and get off here to walk to the Post Office (the building is now used by a dry cleaning shop) on Saturday mornings, when our dad worked a half day.